SteelSeries has announced the launch of its latest gaming header, the SteelSeries Arctis 5 Dota 2 Edition and it will retail for $129.99 in the US and £129.99 in the UK. 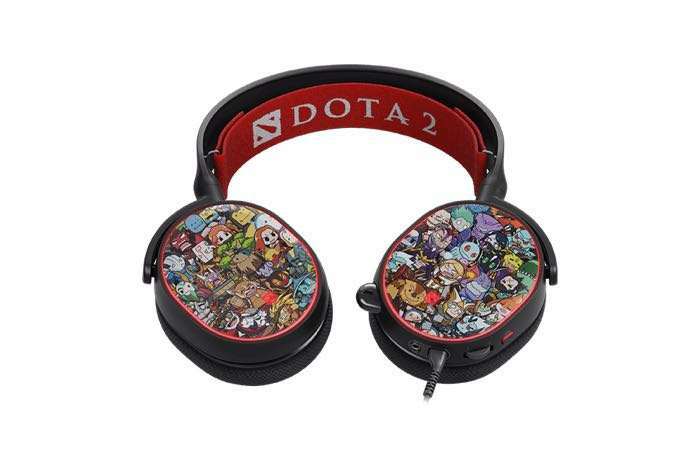 The SteelSeries Arctis 5 Dota 2 Edition comes with artwork by Dota 2 community artists Chroneco and it features 7.1 surround sound. SteelSeries, the fastest growing major PC gaming headset brand in the US*, has teamed up with Valve to announce the new, officially licensed Arctis 5 Dota 2 Edition headset. This limited edition Arctis 5 features Dota 2 character artwork by acclaimed community contributor, Chroneco. The Arctis 5 Dota 2 Edition is available to pre-order now in Valve’s shop – quantities are extremely limited. The limted edition exterior features a special Dota 2 themed design, and the Arctis 5 underneath brings all the features that gamers have come to expect from the Arctis line. The Arctis 5 Dota 2 Edition is incredibly comfortable with its unique ski-goggle suspension headband, customised with the Dota 2 logo, and keeps gamers cool with its AirWeave ear cushions. The headset features the SteelSeries ClearCast Microphone, the best mic in gaming, DTS Headphone:X 7.1 surround sound, and PrismSync RGB illumination, all controlled through SteelSeries Engine. You can find out more information about the new SteelSeries Arctis 5 Dota 2 Edition over at SteelSeries at the link below.